Arsenal and Manchester United have become the latest Premier League clubs to freeze season ticket prices. 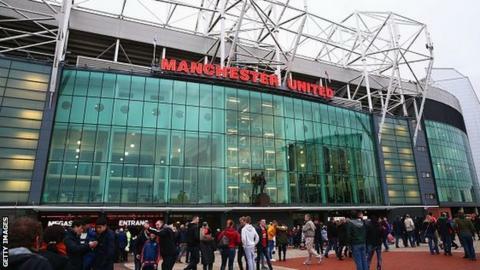 It will be the fifth successive year that the Old Trafford club have capped the cost of attending games. Swansea are among the other teams to retain season ticket costs, while West Ham will lower season ticket prices for their move to the Olympic Stadium. Last February the Premier League sold TV rights to its games from next season for a record £5.136bn, a 70% increase. In October, the BBC's Price of Football study found the cost of watching football in the UK has dropped or remained the same for the majority of fans. The lowest price standard match-day ticket at Manchester United for 2016-17 will remain at £28 for adults, and the highest £50. Junior tickets remain £10 per match. It is the sixth time in seven years that prices have stayed the same. It is a similar scenario at the Emirates Stadium, where it will be the seventh time in 11 seasons that admission charges have been held. The most recent Price of Football survey showed the cheapest Arsenal match-day ticket is 12% below the league average, but their most expensive - £97 - is the highest in the league. Arsenal chief executive Ivan Gazidis said: "We have incredible home support with sell-out crowds for every game. This decision reflects our ongoing aim to maintain a fair and balanced approach to our ticket pricing."